A spokeswoman from Toronto Hydro says a typical Toronto customer pays $110 a month for electricity. In Edmonton, AB, many people spend over $200 a month for heating and power, ouch. 🙁 In New Brunswick a couple’s December energy bill came to $1,935 😯 Utilities can be quite expensive with the snow storms hitting Canada and the U.S. this past year. But not in Vancouver. Climate has been pretty tame these last few decades here. 🙂 I didn’t even turn on my baseboard heater this past winter because it never got cold enough. 😀 Here’s a copy of my most recent hydro bill. Phone bills are cheaper in Vancouver too. According to the cellphone regulator CRTC, people in Vancouver also pay relatively less for our wireless plans than other cities in Canada on average. According to numbeo.com a one-way ticket on local transport in Calgary or Toronto is $3.00. But in Vancouver it’s only $2.75. 😉 A monthly pass is $128.50 in Toronto, but its just $91.00 in Vancouver. 🙂 A brand new Volkswagen Golf also costs $1,000 less in Vancouver than in Toronto. This graph I found from the bcbudget.gov.bc.ca website is a little old but it shows that B.C. has the lowest income taxes for those who are most in need of tax breaks. Statistics show that Vancouverites are wealthier than the average Canadian. This is because a cheaper place to live means you spend less, which leads to more savings and investing. This is further supported by a BMO study which shows that people in B.C. believe they will save about $15,100 this year, while those in Alberta plan to only save $12,500 (21% less,) despite earning higher annual incomes than folks in B.C. I believe this is because the cost of living is higher in Calgary and Edmonton than in Vancouver. We’ve seen how just the electricity bill alone can cost hundreds of dollars more in colder cities. Opps, I thought Vancouver is the expensive city in Canada. Looks like Toronto is the expensive city. In here, you cannot find a one bedroom apartment for less than $1000. I am looking to buy a small house close to Toronto area, but couldn’t find one for affordable price :(. We don’t buy any fancy items, and we shop with flyers; however, we couldn’t restrict our grocery bills for less than $400 :(. Other expenses… you already mentioned :((. Business owners, people with welfare and Rob Ford friends are enjoying the luxury life in Toronto :D.
Vancouver may be affordable if you rent but it’s pretty expensive if you decide to buy property though. Yikes. Listed as world’s 2nd most expensive place after Hong Kong. To be fair though, Krystal is in Greater Vancouver area. And not Vancouver. Very cheek in tongue post you got today. I think gas prices in Vancouver is higher than most cities in Canada. Sure you can rent, but do you want to rent forever? Vancouver has one of the most affordable housing markets in the world. Housing takes the most out of income I think. Yes, we do have high gasoline price here lol. I heard it’s because of the high rate of taxes specific to Vancouver and the lower mainland. I live in the suburbs and it seems only big chain grocery stores are the only grocery stores nearby. I actually enjoy price comparing and price matching. Weird, I know. I’m sure smaller independent grocery stores exist, but I would have to drive further to get to them. Interesting post, I had no knowledge of the other costs of living in Vancouver other than hearing that the housing market was ridiculously expensive there! Seems that you have proved otherwise here though, at least when it comes to renting. I think $1500 a month in a major city (especially one that is as nice as Vancouver seems) is an awesome thing! I don’t see MSP premium mentioned anywhere. As a couple, we’re paying $125.50/mo (or $1,500 a year). That seems like a big one you left off your list. As for apartment, if you have a dog or cat, suddenly the price increases by 50% (if you can even find a place willing to take you within Vancouver). Great point Martin. I forgot about MSP premiums because I’m lucky enough to work for a company that pays for mine so I rarely think about it 😉 But yes, those premiums can put quite a dent in a budget. For a single person Medical Services Plan can cost up to $69.25/month depending on the individual’s annual income. Those making less than $22K a year don’t have to pay any premiums at all 😀 That’s what nice about Vancouver and B.C. in general. The government health officials only require people to pay for public goods if they think it’s fair. your findings are faulty and i don’t agree at all. sure, it’s *possible* to find a place in vancouver for $675, but it’s very very uncommon, and it would be such a pit you wouldn’t want to live there. most one bedroom places in vancouver start at $900. and yes, you can live very frugally, buy marked down food, forego a data plan, and take all sorts of other cost-cutting measures, but you can do that in any major city. it’s a lifestyle choice irrespective of and not bound by geography. you also neglected to mention that the cost of living in vancouver is actually very high because, on average, people make less in vancouver than in every other city you mentioned. we don’t have the oil of calgary and high finance of toronto. we have development, and very few people benefit monetarily from that. My condo fees are about $250 a month. I purposefully chose to buy this condo because it doesn’t have a swimming pool, large gardens, or a fancy gym. 🙂 I find that just having just the basic strata services like garbage removal, building maintenance, and insurance coverage, can keep the condo fees down even over time. My building is over 25 years old. Heh…My expense breakdown is quite similar to yours. And also spending habits. Excellent. 🙂 Great to see someone else with similar financial values. I am so relieved and shocked at the same time as it is very contradicting to the majority of articles out there stating that the city is very expensive. I am probably moving out to Vancouver this upcoming August to peruse a one year degree and I would appreciate it if you could provide me with some of the tips to choose a decent studio apartment not far away from West Broadway where my institution is located. Many Thanks In advance. Hi Anon. There are usually 1 bedroom apartments for $1000 or less around West Broadway. That’s a fairly expensive place in the city because lots of people want to live in that neighborhood but there is not an abundance of housing. If you think $1000 is too expensive you can find apartments in the suburbs for $700 to $800 range. I suggest you choose somewhere close to a Skytrain station, which is our metro system essentially. 🙂 I also suggest you contact the school you are attending and ask them to give you some resources on affordable student housing around the area. Hi I am presently living in Edmonton. and I want to move to Vancouver will you give me some tips about jobs and living there with family. I am new to Canada and every one says it is difficult to live in vancouver because of cost of living. 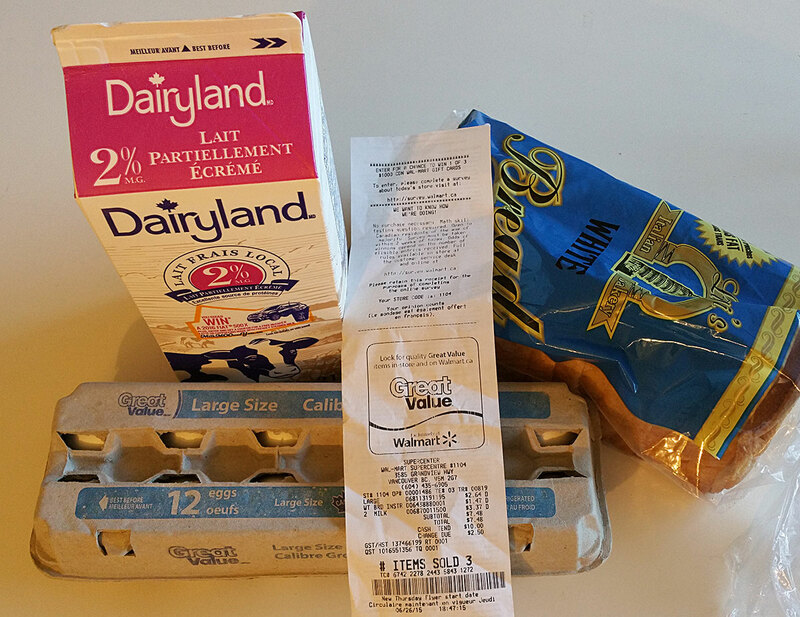 I don’t know what part of Vancouver that applies to, but I can tell you I pay $8 for one loaf of bread and $6 for a dozen eggs. And of course, $60 for one haircut. I can also say there are even more expensive options. Whoever wants to stay healthy should avoid any ready-made food at t&t. You should go to Europe once to see what affordable + high quality means. I like your blog, I just don’t find it realistic. Thanks for the reminder. I forgot to include where to buy the food staples. I usually purchase my bread and eggs from Wal-mart. I’ve added a new picture in the post showing my recent purchase. Prices are higher than in the past, but I think buying a loaf of bread and a dozen eggs for $4.11 total is still affordable for most people. I know the food I buy are not as premium as the ones you eat lol. The address of the store I go to is 3585 Grandview Hwy in Vancouver. Which store do you frequent at? I’m curious to find out what $6 eggs taste like. I enjoy treating myself once in awhile. 🙂 If there’s a big difference in taste and health benefits then I might switch to going for the higher quality foods like you.